Mice are more than a nuisance; they are a health hazard. 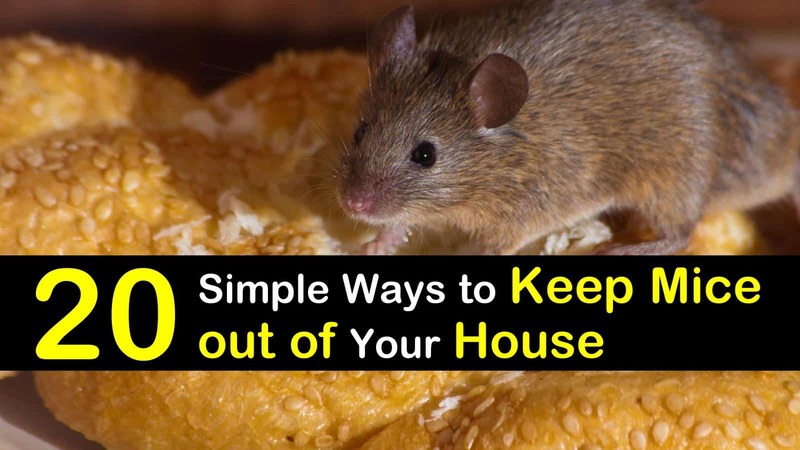 And, unfortunately, any house can become vulnerable to mice, especially in the fall and winter when they are looking for a warm place to call home. But you can win the war against mice and other rodents by following a few simple steps. Rats and field mice are looking for easy access to your house, dependable food and water supply, and a safe place to nest and reproduce. When they find these conditions, they reproduce very quickly. Getting rid of them for good involves denying them all of these things now and in the future. The best time to get rid of mice is before you have them. If you can keep them out of your home, you score an easy win. A simple and effective way to get rid of mice naturally is to deny rats and mice access to your house, garage, and storage unit. Mice only need a tiny hole to squeeze through. Look for holes and gaps around windows, doors, eaves, flashing, and fans. Make sure your weather stripping is tight with no gaps. Small holes can quickly enlarge, and you may soon have more than a rodent infestation. Raccoons, squirrels, chipmunks, roof rats and possums have all been known for finding their way through small holes. Keeping mice and other pests out of your house are the most important step to preventing future infestations. Caulk around pipes and other entry points in the basement and along the foundation. Screen all vent openings and chimneys. Stuff larger holes with steel wool. Mice cannot chew through steel wool, so they will be unable to reopen the hole. Thoroughly wash any areas where you have seen mice or evidence of mice. Mouse urine attracts other mice, and your problem will reoccur if you do not get rid of mouse urine odors. Use carpet cleaners and other cleaners with enzymes that break down urine. Consider applying a mouse repellent like peppermint oil to the area. Food left out attracts mice and provides a food supply for them and their offspring. Keeping food put away or sealed whenever possible, denies them food and encourages them to seek better lodging. Mice make their nests near the closest food supply. Cleanliness goes along with sealing food away but goes even further. Mice will eat paper, cardboard boxes, and other debris in addition to food. Dispose of food and packing quickly in a sealed trash container. Move the trash cans away from the house and use cans with tight-fitting lids. Metal cans with tight-fitting lids are the best because a mouse can still smell food, even in a sealed can, and will chew a hole in the plastic. They cannot chew through aluminum and other metal cans which keeps them away. Don’t leave pet food and water out where they can attract a mouse. Put pet food away between feedings and remove water whenever possible. Mice will seek out convenient water supply. If the supply dries up, they will move on. Encourage them to leave. Mice use their nose to locate food. Peppermint essential oil, along with other strong scents, inhibits their ability to smell. When peppermint oil is present in a strong enough concentration, mice cannot find food or communicate. They usually choose to move on. Keep the oil scent strong and fresh for long-lasting results. What will keep mice away is an often asked question. Electronic pest repellents emit a sound frequency that cannot be heard by humans but will irritate a mouse and hopefully send it running. These ultrasonic repellers should not bother dogs and cats, but they are effective against mice, rats, bats, spiders, roaches, and other pests and definitely will keep mice away. Observe your pets when you first plug them in and make sure they do not react to the sound frequency. Each repeller unit can protect 800 to 1200 square feet. Place them in the attic and on every level of your home for best effects. Traps work, but they are often an unpleasant solution. The other downside is that traps only get rid of the existing population of mice, but do not keep new mice from coming in. The wood snap-type inhumane mouse traps are useful but sometimes a problem to bait and deal with. If you prefer live traps, look into the catch and release traps on the market. Just don’t release the mouse nearby or he will find his way back to your house. Live traps are definitely more humane, but many people are unable to deal with the live mouse. Disinfect mouse traps with a bleach solution made from a ½ cup of bleach in 1 gallon of water. Soak the traps for 10 minutes or more. Rinse and air-dry before reusing. Place glue traps along the wall and in tight spaces where mice run. Mice tend to run along the same paths and stay close to the wall. Be careful handling the traps; it is easy to get yourself stuck. Check the traps regularly and dispose of caught mice and trap in a sealed plastic bag. Poison will get rid of your rodent problem, but it has many downsides also. Use it for a quick fix in severely infested areas or in areas where access is limited. Poisons containing Warfarin kill the mice through internal bleeding and dehydrate the body-possibly inside your walls. In hot, dry areas you may not notice the smell, but in a humid climate, the smell of a dead mouse can be intense and long lasting, another problem you don’t need. Poisons do the job, at least temporarily, but they come with a lot of hazards as well. First, there is the danger of exposure to hazardous poisons for yourself, your children, and pets. Another problem is mice can ingest the poison and then retreat into a wall to die. You are risking germs from the rotting mouse, not to mention that smell. The good news is that there are natural ways to repel mice and keep mice out of your car or camper – use scents that mice hate. You knew that vinegar is useful around the house, but did you know it can help you get rid of mice? Mice do not like the smell of vinegar and will avoid it, if possible. Use this to your advantage by soaking cotton balls in vinegar and placing them around your house in areas where mice visit. Replace or re-soak the cotton balls when they begin to dry out. Mothballs repel mice and humans, so you will want to be careful where you place them. You don’t want your clothes and personal items to smell of mothballs. However, put them in storage areas, attics, and other disused places to repel mice and prevent them from nesting in the area. Plants with strong scents repel mice by affecting their sense of smell and preventing them from detecting food and predators. They must avoid scents that disorient or overwhelm them. Wrap small planting areas with 1/4 inch hardware cloth, buried at least 6 inches below the soil level and reaching 12 to 24 inches above the ground. Also, wrap tree trunks with hardware cloth. The scent of dryer sheets is pleasant enough for humans, but disorienting for a mouse. Other strong smells work equally well. Use pebbles or rocks instead of mulch. Mice love to build their nest in soft mulching materials. Also, keep the lawn cut short and remove potential hiding places such as stacks of brick or lumber. Trim overgrown shrubs and trees and haul off the debris immediately. Unfortunately, there is no easy way to get rid of mice quickly. It takes work and persistence, but these methods do work. The most effective strategy for getting rid of mice and keeping them out of your house is to combine proper sanitation, population control, and excluding them from the property by sealing holes. This guide gives you many good strategies for each of these steps. Use them all together for best results, but act quickly. Mice can reproduce every 28 days. The one mouse you have now could be a houseful shortly. 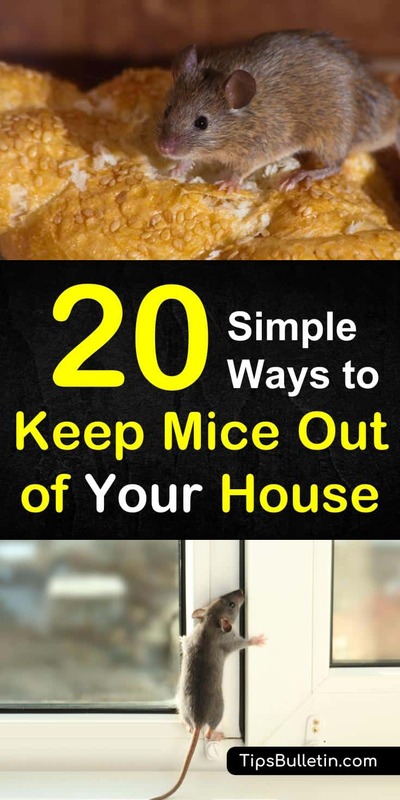 I hope that this guide helps you get rid of the mouse in your house and keep it out forever. If you know of other strategies to fight mice that work, please share them with us. And spread the word now by sharing this article on social media. Fall is approaching, and with it comes an influx of mice.